Still life, which was Cezanne's major theme, offered him complete freedom to paint the subject as he wished. A skillful disorder, the result of a careful arrangement, characterizes the artist's compositions. 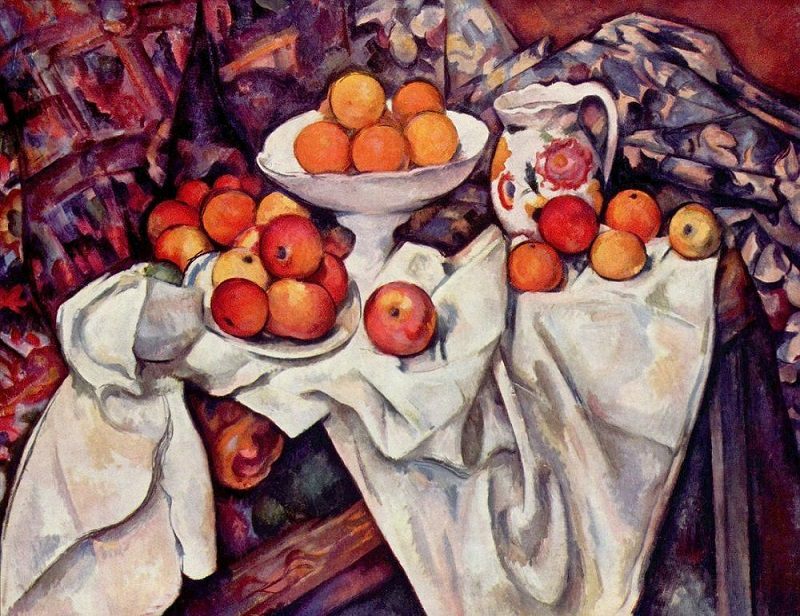 As Charles Sterling wrote, "One cannot help believing that Cezanne constantly had in mind Dutch painters as well as Chardin when, before painting the objects, he would arrange on the table a white cloth which hangs from the edge. Still Life with Apples and Oranges dominated by a white zigzag (far right), or based on the counterpoint of an oval and a play of broken lines, Cezanne's composition is always seen from a superior view. The most lively colors are concentrated on the smallest masses, the rest of the painting being formed of generally soft tones and light hatchwork.